What is a F1 Rocket? Where to put the Training Wheel? Welcome to the main project page. From here you can navigate to any aspect of the F1 Rocket construction effort that you'd like to see. Below, in the status section, you'll find all of my assembly pictures and narrative for every phase of my project. You can start at the beginning and page sequentially through every page or you can click on just a specific item of interest. The F1 Rocket is an awesome, affordable, high-performance, kit-built airplane. It is an all-metal airframe crafted and designed for the discriminating pilot that seeks F-16 like performance at an affordable price. It is capable of climbing at 3,500 fpm and leveling off at 10,000 feet five minutes later for a 230+ m.p.h. cruise. 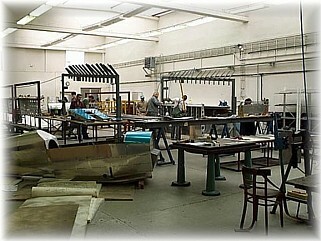 The airframe comes as a quick build kit, which means that a majority of the construction is already assembled for you. The airframes are meticulously built by highly trained professionals from HPA International, a manufacturing subdivision in the Czech Republic. All wing ribs and internal wing parts are anodized for the highest corrosion protection available. All wing skins are primed with epoxy chromate. The F1 Rocket wings are delivered with the spars completed, all ribs riveted in place and the top skins riveted on. The builder will need to install the wiring necessary for landing lights, strobe and position lights, and pitot tube hardware. Once this has been completed, the bottom skins can be riveted in place. The fuselage is delivered with all bulkheads completed and all skins riveted in place. All bulkheads and internal parts are anodized for corrosion protection. All skins have been primed with epoxy chromate for corrosion resistance. 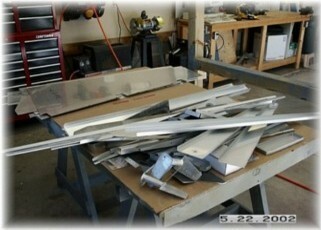 The ELT and battery trays are preformed and ready for final assembly and installation. All fuselage floor and baggage compartment panels are pre-cut and pre-drilled ready to install. The builder will install the torque tube and control sticks, rudder pedals and cables, seats and seatback support, and instrument panel. The finish kit is the most complete and comprehensive finish kit that can be provided. Most parts that are considered upgrades by other manufacturers, are standard in this kit. Fiberglass wing root fairings, fiberglass gear leg and gear leg intersection fairings, Rocket-tip wingtips with strobe and position light bulkheads pre-molded into place with Lexan Plexiglas covers are all included as standard. The cowl is delivered in three pieces for ease of installation. The oil door is pre-molded for ease of construction. The canopy is a slider canopy. The gear legs are manufactured from titanium and are pre-drilled to the engine mount. The wheels, brakes, tires, tubes, brake lines, pitot lines, master cylinders, and fuel lines are all included in the finish kit. The empennage kit is not included in the Quick Build Kit and is considered a starter kit. This is done for two reasons: 1) This gives first time builders an opportunity to discover mistakes on parts that are not expensive rather than on areas that are very expensive. 2) When Team Rocket went through the FAA 51% certification process, it was determined that they could do considerably more of the difficult construction on the wings and fuselage by making the tail its own kit. If you want the full scoop on the F1 Rocket, visit the Team Rocket web site by clicking here. Pilots like to debate. No, forget that. Pilots like to argue……sometimes vehemently over some insane topic. None stokes the fire like a good tail wheel/nose wheel debate. 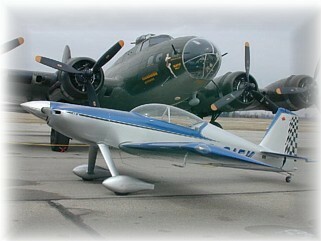 Or like us tail wheel pilots like to say, "Where are you going to put the training wheel, up front or in back?" The reason this issue even comes up at all is that when a builder makes the choice of which airplane to build, they often have the option to build either a tail dragger or nose dragger. For the Rocket crowd, there is only one option at the moment. But for the RV crowd, each model can be built in either configuration. Having built and flown a RV-6, and being a relatively low time pilot (less than 600 hours), I feel at least as qualified as other pilots to have an opinion. If you are stuck in this quandary and can't decide which model to build, my advice is to build the configuration you are most happy with and most comfortable flying. There is no right or wrong choice. I built a tail dragger because I liked the way it looked and I wanted the challenge of learning to fly one. I found the RV-6 to be a piece of cake to land. You have to stay on the rudders all the way to the hanger but I didn't find it difficult to master. During my tail wheel endorsement instruction, I found the Citabria much more difficult to handle, especially in a crosswind. I became so comfortable landing the RV-6 that I routinely flew in 20-25 knot crosswinds without worry. I even landed it once in a 40-knot crosswind in Arizona. It is my opinion that the nose dragger versions are safer and less likely to experience a landing accident. I say this because the physics say so. Nose draggers are inherently safer because the center of gravity is forward of the main gear. In a tail dragger, it is reversed and in the wrong hands, a tail dragger will swap ends on you. That doesn't make it more dangerous, just more prone. I think Van's sells about equal number of tail draggers and nose draggers. In the group I fly with, tail draggers are the predominant configuration. Everyone's situation is different. Don't let your ego or the ribbing of your fellow aviators sway you one way or the other. Pick what's right for you and don't look back. I recently saw this on the Matronics email list and thought it was appropriate. I didn't write it and would gladly give the author due credit if I knew who he/she is. If you do, drop me a line and let me know. Tail dragger, I hate your guts. It takes a little rudder....easy, that's too much ! Takes a little rudder.....easy, that's too much ! Or it heads towards for the boonies as you pour on the coal. Just a little rudder....easy, that's too much ! That's my own tail that 's going by! Give a little rudder....Good Lord, THAT'S TOO MUCH ! This is major argument number two among builders. The question is whether to prime perfectly good Alclad aluminum or not. There is no debate about whether to prime non-clad parts. You must prime these parts because they will corrode and relatively quickly. These parts are usually easy to prime and represent a small percentage of the airframe. They are usually small parts like hinge, plate, angle, bar, and anything steel like engine mounts, gear legs, etc. No, the real primer war issue centers on priming parts that are fabricated out of Alclad aluminum sheet. These parts tend to represent the major structural components like ribs, bulkheads, and skins. And the answer to the question is "It depends." It depends upon your circumstances. If you live in a salt air environment and your airplane will see a lot of time outdoors, then I think you have a glimmer of an argument for priming. The problem is that the way most folks prime, they are not improving the corrosion protection over the Alclad. I'll speak more about this in a second. If you don't live on the coast, then I think additional priming is a waste of time, money, and weight. To do priming right, you need to prep the surface so that the primer will adhere properly. This usually means acid etching the surface. Then, you need to apply a primer that is an effective water barrier. 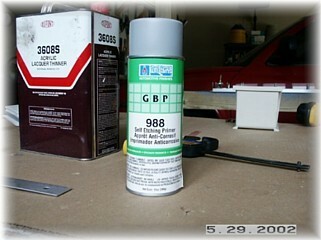 The most common primer is a metal-etching wash primer. This type of primer is NOT an effective water protection barrier and the instructions usually state that it must be top coated in order to maximize the protection. Epoxy two-part primers are the most effective since they are water barriers but they are the most toxic and the most time consuming to apply. Starting to get the picture? To prime and to do it properly takes a lot of time, careful procedures, and expensive and toxic primer. The benefits of going to all that work to prime an airplane that will be hangared and babied its whole life are marginal at best. Have you ever peered inside the fuselage or wing of a 40 year old Cessna? Know what you'll find? Bare Alclad aluminum that's what and very little, if any, corrosion. My strategy for priming is to only prime the parts that need it. If I get any indication of corrosion, Cessna makes a corrosion stopping/prevention fogging agent. If I'm so inclined, I may fog the inside of my bird once it's painted.